Spend a day in the historic Corolla Village for amazing lighthouse views, wildlife education, the Whalehead Club, area history & more. Located north of Duck and south of Carova, the village of Corolla features all of the necessities one needs while vacationing on the northern beaches of the Outer Banks. Grocery stores, gas stations, local restaurants, gifts and specialty stores cater to the area but do not overshadow the charm of the small beach town by overpopulating the landscape with national chains. 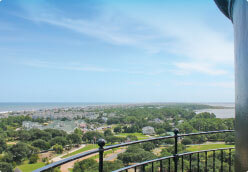 Corolla is home to Historic Corolla Village, Whalehead at Historic Corolla and the Currituck Beach Lighthouse. Located within an easy walking distance to one another, the three offer beautiful scenery and some history of the area's early years in hunting and industry. Additionally, there is now a pedestrian path along HWY 12, linking most of the communities of Corolla together, making it easier for visitors to safely walk to restaurants and shops. Sun Realty is proud to represent vacation homes in the village of Corolla and the properties offered by Sun Realty range in size from two-bedroom condominiums and smaller vacation homes to elaborate, seven to 12-bedroom rentals in this area. Known for its upscale accommodations, resort-like communities and some of the most wide and pristine beaches along the OBX, Corolla offers a lively family-friendly atmosphere within a charming coastal setting.